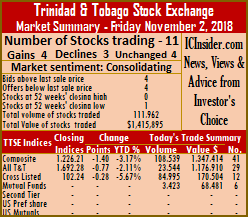 Trading on the Trinidad & Tobago Stock Exchange on Friday remains low but picked up to 111,962 units valued at $1,415,895 compared to 16,715 shares with a value of $445,427, changing hands on Thursday. Market activities ended with 11 securities trading against 15 on Thursday, 4 advanced, 3 declined and 4 remained unchanged with the Composite Index declined 1.40 points to 1,226.21. 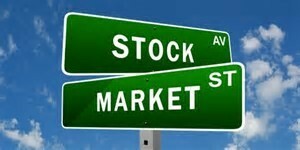 The All T&T Index lost 0.77 points to 1,692.28, while the Cross Listed Index fell 0.28 points to close at 102.24. Stocks closing with gains| Clico Investments rose 1 cent to close at $20.01, with 3,423 stock units changing hands, Republic Financial Holdings concluded trading and rose 1 cent to $106.61, after exchanging 5,986 shares, Sagicor Financial added 5.00 cents and ended at $7.50, with 5,313 stock units changing hands and Trinidad & Tobago NGL gained 8.00 cents, settling at $29.49, after exchanging 17 shares. Stocks closing with losses| First Citizens concluded trading with a loss of 4 cents and settled at $32.65, after exchanging 9,105 shares, JMMB Group fell 6 cents and ended at $1.64, after exchanging 79,682 shares and National Enterprises lost 1 cent to close at a 52 weeks’ low of $8.49, with 500 stock units changing hands. Stocks trading with no price change| Guardian Holdings completed trading at $16.75, with 4,165 units, Massy Holdings ended at $46.75, after exchanging 3,403 shares, Prestige Holdings completed trading of 100 units at $7.50 and Unilever Caribbean ended trading at $25.00, with 268 stock units changing hands.